Family fears foul play in League City mom's disappearance. LEAGUE CITY, TX (KTRK) -- As the search for a missing League City woman began today by Texas Equusearch volunteers, police said her ex-husband was the last person to see her before she apparently vanished. 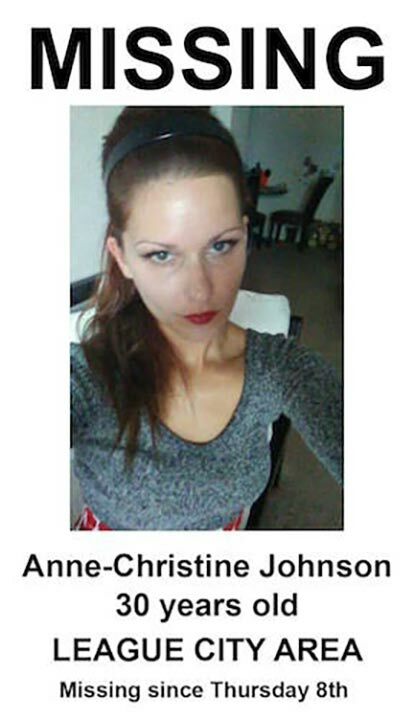 Anne-Christine Johnson, according to League City police, would stay "on and off" at her ex's home. She left the house December 7. Police said he told detectives he saw her getting in a white sedan, with someone behind the wheel, and left. Johnson has two sons and family members say it is not like her to disappear. The two boys are also wondering where she has gone. They are ages 8 and 5, the youngest of which with autism. "She's my daughter, she's my daughter and I just...I am very upset about this, and I know that League City police are doing everything that they possibly can," mother Stephanie Johnson said. At this point, police don't suspect foul play, but they can't rule it out either. Equusearch is set to launch a search Thursday morning for a League City woman who hasn't been seen in almost a week. Johnson worked at Legends in League City. Last week she called in sick and then failed to show up at a dinner with her father the next day. Now volunteers are trying to find her. Her ex-husband didn't report her missing. When she failed to show for a planned dinner with her father, he became worried, and filed a missing person's report Monday. "We are concerned for the safety of Ms. Johnson and want to locate her," said League City police detective Austin Frakes. Texas Equusearch Tim Miller was contacted by the family Tuesday, and launched the search today. Volunteers combed an area not far from the ex-husband's house throughout the day, but found no sign that Johnson had been there. "In cases like this, you don't know if they left on their own, whether they chose to harm themselves, or whether there's been foul play," Miller said. She hasn't been heard from for 8 days, and that complicates the search for her, he said. "We're a week out and sometimes you say it's a cold case, before it became a missing person case." Johnson is 30 years old. She has blonde-red hair, and was last seen wearing a pink scarf, like in the photo on her missing person flier. Anyone with information on Johnson and where she may be is asked to call League City police. Texas EquuSearch has joined the effort to find a League City woman. Jeff Ehling reports.